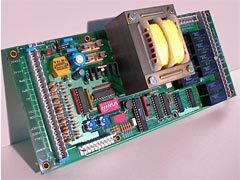 Unique card grouping command, power inputs and outputs, and power supply, and able to receive a graduator card permitting the motor\'s braking control. * 2 potentiometers for time instruction adjustment. * 6 outputs 230 VAC (relays).